Al Mehtab Group is headquartered at Dubai. In the early days of 1925, Sardar Mehtab Singh, the founder of Al Mehtab Group set forth from India and landed in the Middle East to seek his fortune and made the Middle East his home. His trader’s instinct and a sense of adventure soon made him gain tremendous respect, wealth and status in the business world. A very well read, religious and fan of the good life. He entertained the best of nobility with sense of humility and purpose. His larger than life personality, great sense of humor and rugged looks made him the city’s most respected businessman. He was visionary with a passion for work, which lived life on his own terms. The beginnings were modest and mostly confined to food commodities. Behind the simple mechanism of buying and selling grew a trading house of international repute at the helm of which was a sensitive and highly professional decision making man. Business flourished, his sons joined him in the business and learned the business under his able shadow. As time moved on, various companies were formed and business expended. 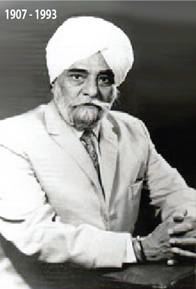 Sardar Mehtab Singh is no longer with us but his spirit lives on in the Al Mehtab Group. The business is on the way to rapid growth under the dynamic leadership of succeeding generation headed by his son Jagjit Singh and grandson Gurjit Singh. The group is successfully involved in the trading of commodities, contacts developed around the world and pooling of expertise and resources have helped meet the growing needs and demands of the region. Al Mehtab Group has always worked with a policy to grow with hand to hand coordination and growth. We are always open for new business relationship with new groups to expand our network to the new corners of the world.